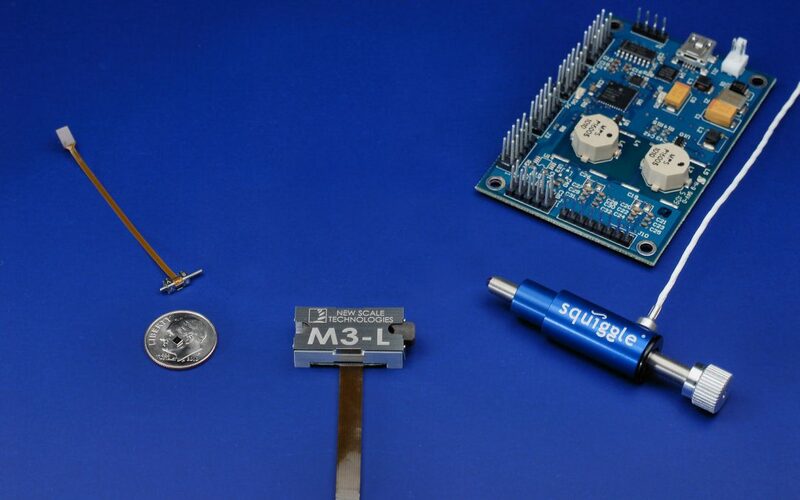 Since 2006, SQUIGGLE piezo motor systems have shrunk in size from a 12 mm diameter motor with 51 x 76 x 14 mm drive card (right), to a 2 x 2 x 5 mm motor with a flip-chip drive ASIC (shown on the dime) (left). This enabled the creation of integrated micro-mechatronics modules such as the M3-L module (center) – complete closed-loop motion systems in housings of less than 7 x 12 x 30 mm. Designing with piezoelectric (piezo) motors requires a different mindset than that used with traditional servo or stepper motors. The traditional approach of specifying the motor and then buying or designing the control system works for servo and stepper motors because there is a vast body of “cookbook motor” control solutions and experienced drive teams available for traditional motor implementation. This is not the case for piezo motors, which require special drive circuits to create and maintain ultrasonic resonant vibrations in the motor. In addition, piezo motors are most effective when the mechanics, electronics, control system, software – and even the motor design itself – are developed in concert. In this way the piezoelectric ceramics, the silicon, and the system can be tuned to work together for optimal performance. 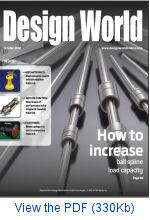 It is a perfect illustration of the benefits of a mechatronic design process. Here’s what happened in a multi-year collaboration among engineers and scientists at New Scale Technologies, austriamicrosystems (now ams) and TDK-EPC to simultaneously develop the motor, mechanics, electronics and control systems for the M3 micro-mechatronics module.